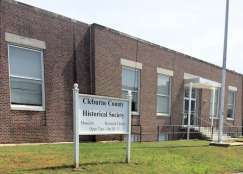 The Cleburne County Historical Society has moved to the “Old Post Office” building at 102 East Main Street in Heber Springs (northeast corner of First and Main Streets). The Historical Society office, a greatly expanded museum and research library are all located there. Entrance is on the First Street side. The historic Old Post Office was built in 1937 as the Federal Building, housing a post office on the main floor and Department of Agriculture offices in the basement. The building was expanded in 1962 and sold to the county when a new post office was built in 1991. The county used the building as a District Court until 2013 and then it served as a temporary location for the county library. The county and the Historical Society have partnered in establishing a county Historical Center at the location. The original post office Mural, painted in 1939, has been restored to its original condition. The Historical Society was formerly located in the historic Frauenthal House at 210 North Broadway in Heber Springs for more than 20 years. The Frauenthal House is still owned by the Historical Society and the future of the house has not been decided. The house is on the National Register of Historic Places and is designed in the Craftsman style of architecture. It is a single-story, wood-frame building erected in 1914 for Frauenthal, a prominent businessman and landowner in the early days of the county. It was designed by an architect whose identity is currently unknown, yet who was obviously well versed in this style of architecture. The use of a multiple-gable roof, wood-shingle siding and Prairie-style windows distinguishes this house from the more common vernacular examples of the Craftsman style. Membership in the society is open to anyone who has an interest in Cleburne County and its people and in the history of the region. Membership is $15.00 per year or $250.00 for life membership. Members receive four quarterly issues per year of the Historical Journal, which includes pictures, stories, and remembrances about the history of Cleburne County. Members also receive four society newsletters per year, and have use of the research library at no charge. Do you have old pictures or articles that show Bridal Veil Falls as the tall straight one? I lived in Heber 13 years, and saw some old pictures labeling Bridal Veil Falls. I would be more than happy to pay for copies or information that supports this. Thank you. My grandfather was William Smith, he died in nov or Dec 1917 and my father Ruel Pink Smith was born Jan 11 1918. They lived in Wolf Bayou my Grandmother was Anna Louisa Teal. My father went to school, what little they had back then. to a little school my dad referred as Puttin Ridge or perhaps Pudden Ridge. William and Anna had a daughter named Effa Mae Smith born 1910, my grandmother was married before to a William Taylor and they had 2 boys, Rancy Taylor and Ira James Taylor. I am having the hardest time finding any clue’s altho I’m sure they are there, I would like to become a member and ask if you have a registration form that can be emailed. I’m looking for some help with obituary lookups. Can you help with this, or can you suggest who to contact? I’m looking for the obituaries for Rosanna Davis Steadman d. Dec 23 1994 and her husband Roy Nelson Steadman d. Mar 23 1969.
do you have any info on the date the church building, currently known at HS Christian Church on 1101 N. Broadway, was built? Also, do you have info on what may have been there before the church building was built? Hi I am looking for historical maps of Heber Springs. Would you have access to any or know where I could find them? Many thanks in advance! also am very interested in a map or list of historical markers in Cleburne County! Hi. I read once about the history of the Ozark Trail Festival. I can’t seem to find it now. My family is coming this weekend and I’d like to share it with them. Could you please direct me to it online? My Grandfather was John Martin Pickens. He owned and operated two Grocery Stores that I was told were in Heber Springs. I have pictures of the store fronts. One of these the signage names the store as “J M Pickens” advertising Cleo Cola. This would have to have been post 1930’s since Cleo Cola didn’t exist prior to the 1930’s. Is there any records that I can search there to confirm that these were in fact in Heber Springs? My great, great, great grandfather Luke R. Crawford was a carpenter and farmer. He was born in Cowetta GA in 1830, and moved to Cleburne Co. AL in 1855 and started the Crawford family farm. He also helped build churches and homes in the area as he was quite handy with a hammer. I wish I knew if there were any structures still standing that he could’ve helped build, between 1855 and 1885. I received a copy of a quarterly many years ago that had an article regarding the tom brown and Bettis families. I believe it was written and put together by Mary sachettie. I have misplaced my copy. Would it be possible to get a copy of that again? I am not even sure what year it was published. You need to contact the historical society directly. EMail cchist@ipa.net , phone, or snail mail. I am not sure how often anyone is checking comments and I live out of state now. Sorry.